1. Philadelphia - Luke Joeckel - I think the writing is on the wall. 2. Jacksonville - Dion Jordan - help make their defense a part of their offense since Gabbert is terrible and Henne isn't taking them the distance. 3. TRADE!!! - Miami sends Oakland a haul to leap frog Philadelphia and ensure they get the premiere tackle in Eric Fisher. Explanation: Throw out the darn draft value chart, Oakland needs picks!!! I found Ireland's comment the other day telling when he said you don't lose Jake Long without feeling the loss. He'll continue to be aggressive in giving Tannehill everything he needs to succeed. Miami has 11 picks, and plenty of cap room to sign stop gap vets so why not go for the gold. Oakland can take pennies on the dollar because they need draft picks and ammunition to trade for Matt Flynn after they cut Carson Palmer. And as I said earlier I expect Miami to deal Bess, probably netting another 4th rounder. This is the perfect draft for Oakland to drop back and not lose too much value. 4. Philadelphia - Star Lotulelei - Kelly needs a big guy to power Philly's D-line. 5. Detroit - Dee Miliner - Best guy on the board, can't pass that up. 6. Cleveland - Jarvis Jones - Jones and Krueger just sounds awesome. 8. Buffalo - Cordarelle Patterson - Nassib is the QB, this is his weapon. 10. Tennessee - Chance Warmack - Gives Locker a nice line with Levitre. 11. San Diego - Jonathan Cooper - BPA and helps an awful line. 12. Oakland - Geno Smith - Lady Luck finally smiles again on Oaktown. 13. Tampa - Xavier Rhodes - Fills a big need. 14. Carolina - Shariff Floyd - have to be thrilled he's available at this point. 16. St. Louis - Kenny Vacaro - Desperately need a safety. 17. Pittsburgh - Tavon Austin - No Wallace, No Sanders? No problem. 18. Dallas - Sheldon Richardson - Youth is needed for that D-Line. 22. St. Louis - Keenan Allen - he's better than what they currently have. 26. TRADE!!! - Buffalo moves up to get Ryan Nassib. But what's the point now, there is no competition? Player value is getting muddled and GB has a lot of money they'll be spending on Rodgers and Matthews. They are willing to deal and just want more picks. Jax, Philly, Arizona and NYJ all need QBs still. Plus, lets be honest, Nix is an idiot. GB will probably get a nice package of picks to start filling in OL, CB/S, and TE needs for the future. They always draft well. 27. Houston - Justin Hunter - Patton might be more reliable but I like Hunter. 29. TRADE!!! - Jacksonville jumps up to get Matt Barkley. New England is always willing to trade and only falls back a few spots. I could see Jax getting antsy that someone else will make the move so why not get it out of the way. Even better, I bet Gabbert is cut or dealt for a late round pick. 31. San Franciso - Eric Reid - Struggled with this one. Its my mulligan. So there it is, rip it, change it, add to it, but simply just have fun. Yeah I know the Miami move is out of left field and rather bold, but its better than the same ol' talk of Rhodes, Trufant or Cooper. I would love it if you replaced the name Fisher with Milliner, if not Tavon Austin #12 for me please! The only thing worse than drafting a LT with the #1 overall pick would be to give up "a haul" to draft one at #3. They need 2 CBs and a LT before they start the season. They don't need to put it all into one LT.
Why don't we sign Winston and give Johnathan Martin a chance to play LT? I don't mean the few starts he got when Long was hurt, I mean draft a LT in the 2nd or 3rd and allow Martin to compete in camp to win the job. Why draft a LT high when we have somebody capapble of doing the job. I don't remember too many 1st rd LT's that started from day 1 who didn't give up any sacks their first year! These are all reasonable and expected responses. Again I tried to be outside of the box a bit. This draft only has a few elite talents and I think Fisher is one of them. What did Jonathan Martin prove last year? Not much. I took into consideration a lot of discussion here about his lack of strength and how that is something that doesn't just change overnight. If Miami was really in on Long til the end then obviously they aren't comfortable with Martin at LT. This season and Ireland's future depend on the success of Tannehill. Are they really going to leave the protection of that investment and this regime to a question mark who couldn't really handle the right side? The big question mark is for this mock is how much does that move cost? This is a weird draft and there isn't and RG III that will spark a multiple 1st round pick trade. Oakland is desperate for picks so I'm wondering if Miami can get away with a steal. Outside of Tavon Austin, the guys we are talking about some to be late 1st round types. Why not take a chance if the opportunity presents itself? Btw, I also did this with the thought that Miami will keep one of its 2nd rounders this year to address CB (along with the Grimes assumption). The Lance Louis signing makes me think that the Cooper option is out as well. What about moving up 1 or 2 spots and taking LT Lane Johnson? I don't think he goes as high as people think....Manuel, Glennon and Barkley will creep into the 1st round IMO and one of them will go with Smith in the top 10....All Great news for us! I'd rather have Lane Johnson than Fisher. I'd also rather have Rhodes than Fisher. I'm hoping we stay at 12 and Lane Johnson or Xavier Rhodes is sitting there for us. It actually sounds like Johnson is the Tannehill of OTs. Switched positions, still learning, but really came on his senior season. I'm not opposed to it. Again, I realize what I mocked has less than a 10% chance of happening...probably less than that. Just sounds like Fisher is a great fit for Miami and gives you Jake Long potential at a fraction of the cost. I wouldn't be a happy camper. Let's just put it that way. I think if they move up it might be with Cleveland. The Browns love moving down. Certainly thinking outside of the box Dan, especially when you consider that Ireland has NEVER traded up while with Miami. 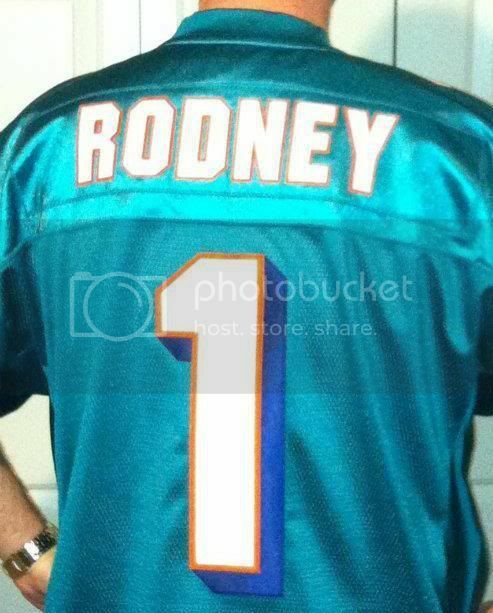 I do agree with Dphins4me when he states that Miami has holes to fill. Ireland seems to want to get even younger and continue to add talent to this roster. A kid that could be there in the 2nd round at OLT is Terron Armstead, the kid from Arkansas Pine Bluff. He has the speed and quickness to play in the zone blocking system the Dolphins implement. He could even play ORT, as I think the Dolphins are committed to Jonathan Martin at OLT now. That being said though, it would be interesting to see if Ireland did indeed look to move up to get someone. I don't think he will though. If Miami stays at 12 and takes a CB or Austin then that is the guy I see them looking to get in Rd 2. Don't forget that there were reports Ireland explored what it would take to move up and get RG III last year. Different player, different need but also this is the year where you probably can move up for less cost. As I said, I was just having some fun and don't think what I proposed is likely. Miami desperately needed a QB last year and Andrew Luck and RGIII were considered the top 2 QB by far. While will not to give up as much possibly, to move up to #3 would still be costly. Did you mean that he has never traded up in the 1st round while with Miami? Yes. I know Miami traded back up in the draft a couple of years ago to get Daniel Thomas, but that was back into the 2nd round I believe. The only time he moved a 1st round pick was in 2010. Coincidentally the other team moved up to get...you guessed it, a RB.